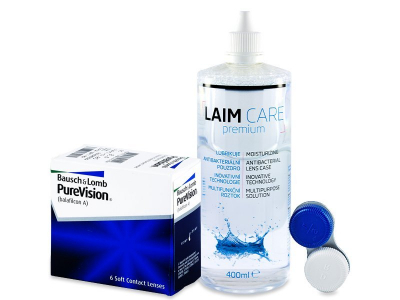 This value package contains one pack of six PureVision lenses and a 400 ml bottle of Laim-Care solution. PureVision lenses have a monthly replacement schedule and are equipped with Performa technology to enhance moisture and comfort. PureVision contact lenses by Bausch and Lomb are monthly contact lenses that are suitable for continuous wear for some users. The surface of PureVision lenses has been profoundly improved by the brand's use of the revolutionary Performa technology, which ensures maximum moisture and minimises the sensation of dry eyes. Continuous wear must always first be consulted with your eye-care specialist or ophthalmologist. PureVision contact lenses are perfectly suitable for regular, daily, or occasional wear. Each box contains six lenses.